Chronic sinusitis is an illness characterized by prolonged infection and inflammation of the lining of the nose and the sinuses. Patients with chronic sinusitis experience a variety of symptoms, including facial pressure, nasal congestion, discolored nasal discharge, and “post-nasal drip”. Endoscopic sinus surgery is a procedure designed to open the natural drainage pathways of the sinuses to restore their function and health. Endoscopic sinus surgery is used to relieve symptoms associated with sinusitis, septal deviations, turbinate hypertrophy and nasal polyps. Before surgery, Dr Kluge will attend to you, if you have any concerns, please do not hesitate to ask him or the attending nurse. You will be given anaesthetics and moved into the operation room. Once asleep, Dr Kluge will start the procedure. The procedure is all done inside your nose. There should be no skin incisions, unless it was a complicated procedure which would have been discussed prior to the operation. The risks of serious complications are very small, but please take note of the following possibilities. Bleeding is a risk following any operations. It is very common to experience small amounts of bleeding to come from the nose in the days following the operation.After the surgery it is possible to experience some bleeding until approximately day 5 post-operative. 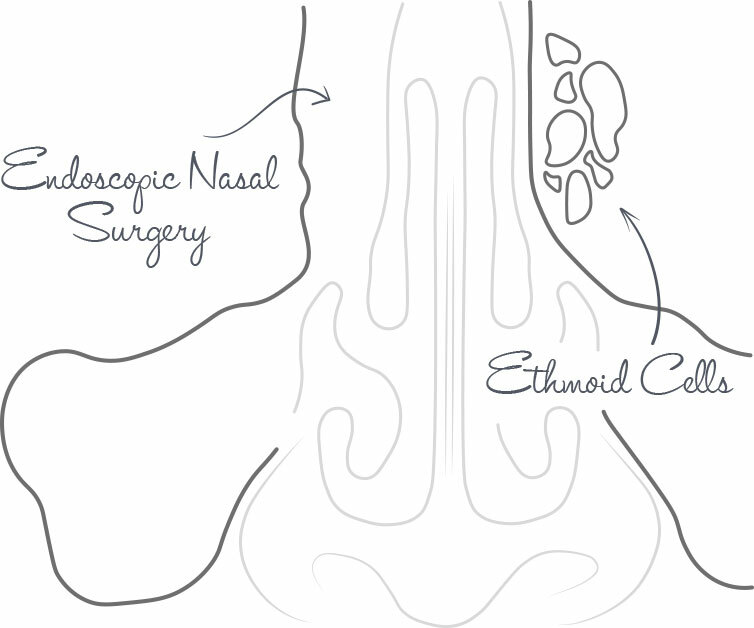 You will experience nasal and sinus pain and pressure for the first several days after the surgery. Expect to feel very tired in the 1st week after the procedure. You will have nasal congestion and a discharge for the first few weeks after surgery but your nasal passage and breathing should return back to normal 2-3 weeks after the procedure. Nose blowing, straining and heavy lifting for at least 10 days after the surgery. Asprin or non-steroidal anti-inflammatory medications should be stopped 2 weeks prior to the operation and avoided 2 weeks after the operation as it may cause bleeding. Steroid nasal spray should be stopped for the first 2 weeks after surgery to allow the lining of the nose and sinuses to heal. Cerebrospinal fluid leak and brain injury. Eye injury; blindness, double vision, swelling and bleeding into the eye can result as well as tearing due to damage to the tear duct. Please do not be alarmed. Serious complications occur in less than 1% of these operations. The maxillary sinuses are located right behind the cheekbones. The function of the maxillary sinuses is to drain into your nose, below the corners of the eye. This area is called the Osteomeatal complex. When the Osteomeatal is blocked, the sinuses no longer drain and this causes infection. This procedure rinses the maxillary sinuses. During the procedure, a small needle is inserted into the sinus and the sinus is rinsed. No surgery is 100% safe, but every effort shall be made to ensure a positive outcome. The risks include anaesthesia and infection. Although rare, injury to the eye and tear ducts may occur, as well as excess tear production and nosebleeds. Remember to book your follow-up appointment as discussed with Dr Kluge.